We also do compact light and camera models for saturation diver helmets and HAZMAT operations. These lights and cameras are intrinsically safe and can be used in oil, gas production, fuels and chemical locations. We were tasked on the development of a new lighting concept for a ROV project in the UK university, This light system is a stripped down edition of our prototype lights keeping the cost to a complete minimum. The Poseidon light system is a 3 light unit with 2 wide flood on each side and a spot in the centre for navigation in lower visibility conditions. Pictures below shows live testing after assembly and there integration or all the components the following article was submitted by Professor Robert Stone. 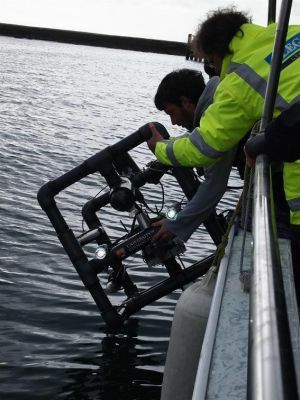 The Geo-technical Research Group based at the Institute of Technology Sligo Ireland is developed deep-water anchoring systems for floating oil and gas platforms. Part of this development involves field testing of reduced scale anchoring systems. Field testing was carried out in Lough Erne - one of Ireland’s deepest lakes (+70 m). Visual inspection of the mooring line was required at the lake bottom in order establish the penetration depth of the anchoring system. During the summer of 2012 we were approached by world fish.org to let them use the Sea-monkey ROV to assist in the classes to teach children the importance of the marine ecology and how we maintain our waterways, The demo day consisted of a school group taken down to the harbor in Victoria BC and test the sea-monkey ROV, Allowing a great view the sea-life from the comfort of the shore, the system utilized a very common game controller allowing children to become familiar with controls far more rapidly in other systems making learning fun and exciting. Further details on the programs offered can be found on the links page.